One enemy spy knows the secret of the Allies’ greatest deception, a brilliant aristocrat and ruthless assassin—code name: “The Needle”—who holds the key to the ultimate Nazi victory.Only one person stands in his way: a lonely Englishwoman on an isolated island, who is coming to love the killer who has mysteriously entered her life. Ken Follett’s unsurpassed and unforgettable masterwork of suspense, intrigue, and dangerous machinations of the human heart. Ken Follett, a Welsh novelist has written important bodies of work, such as: Eye of the Needle, The Key to Rebecca, Pillars of the Earth, World Without End, Whiteout, The Century Trilogy. His genre includes thrillers and historical fiction. As a youth he was never allowed to watch television or movies, so out of boredom, he developed a keen interest in reading. Follett had various jobs on his pathway to being a novelist. He was a general assignment reporter for the Evening News in London. He found that work to be very unchallenging, so he took a position as managing director of Everest Books and began writing fiction as an evening hobby. With the publication of Eye of the Needle in 1978 he became not only internationally known, but also wealthy. 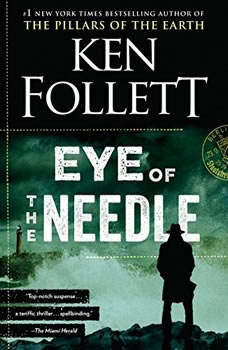 Follett’s next project is a third book in his Kingsbridge series. The first two were The Pillars of the Earth and World Without End, and is to be released in 2017. I found the author introduced too many players and too many situations to keep following along, my husband however loved it so I'm thinking maybe more of a guys plot, or at least you should be a fan of thrillers.